After traveling to Disney this month, I learned more about how to use the Disney Magic Bands, which you can see from my post here. I also discovered some fun accessories you can buy to make your Magic Band Magical with Disney Magic Bands Accessories! There are three kinds: Sliders, Bandits and Covers. The Bandits pop into the holes on your Magic Band. The holes on the Magic Band are there to adjust and customize the width of your magic bands. Once you set the Magic Band to your wrist, there will be ‘leftover’ holes and this is where you can use your Bandits! This accessory is best for teens and adults as I find that the extra holes are not exposed when using the Magic Band on a child since their wrists are smaller. Covers are there to cover your magic band (though the Mickey Mouse emblem will be exposed since that is where the ‘chip’ is). Deck out your band in Mickey or Princesses. Or color coordinate to your vacay outfit. This works for most everyone, but may not work on smaller children. On a smaller child, you can remove the black piping from the magic band in order to make it smaller for little wrist. However, by doing that, the Magic Band becomes smaller in size so that the Magic Band covers become too big. However, you can ‘scruch’ them for a ruffled look. Last there are the sliders. They ‘frame’ the Mickey Mouse emblem (kind of like a picture frame) or just slide up the band. It gives your band a ‘watch’ look. This seems to work the most for everyone ‘s Magic Bands – adults to small children! Then, you can mix and match. Use the bandits and the slider or the slider with the cover! Have fun with it! As of the writing of this post, the covers range from $6.95-$15.95, while the Bandits are $6.95-$8.95 and the Slides $12.95-$14.95 and you get a few to play with in each pack. 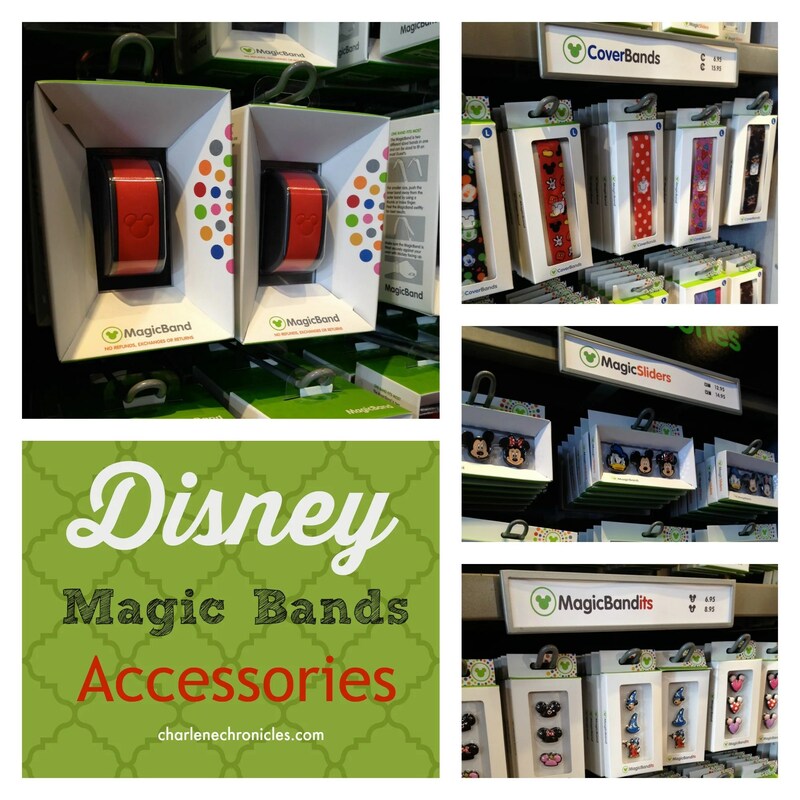 You can find the Magic Bands and accessories at the main Stores like the World of Disney store in Downtown Disney (Disneyland and Disney World), as well as the Emporium on Main Street USA. There is even a Magic Band store outside of the Ticketing Center at Magic Kingdom. Just ask a cast member where ever you are, for the nearest Magic Band location!